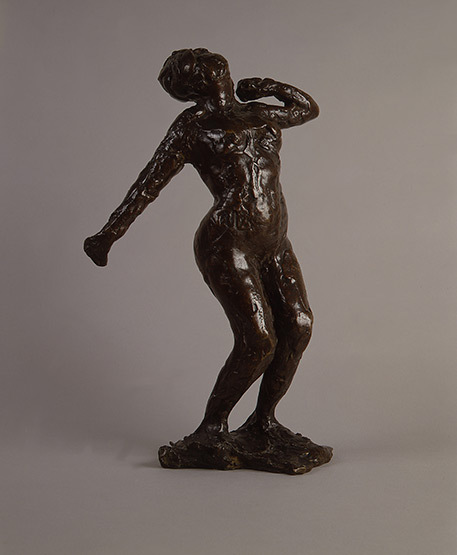 Edgar Degas, Woman Stretching (Femme s'étirant), 1896-1917 (wax model), 1919-1921 (edition cast), Cast bronze. Smart Mueum of Art, The University of Chicago, The Joel Starrels, Jr. Memorial Collection, 1974.147. What makes an object a sculpture? The immersive exhibition Carved, Cast, Crumpled investigates the essential qualities of three-dimensional art across historical and cultural contexts, questioning what it means to be in the presence of an object. The exhibition is the first in a series of special projects celebrating the Smart Museum of Art's 40th anniversary. Comprised entirely of three-dimensional works and a handful of drawings by sculptors, it showcases a foundational component of the Museum’s collection, one that can be traced back to the Joel Starrels, Jr. Memorial Collection of modern sculpture that was featured in the Smart’s inaugural exhibition in the fall of 1974. The exhibition takes over the entirety of the Museum, transforming both spaces normally dedicated to temporary exhibitions as well as those that are home to longer-standing installations of the Smart’s collection. Highlights include small-scale sculptures by modern masters like Auguste Rodin, Jacques Lipchitz, and Henry Moore; ancient Chinese mingqi tomb figures and Buddhist devotional statues; European bronzes of princes, putti, and classical heroes; and boundary-breaking work by contemporary artists including Magdalena Abakanowicz, John Chamberlain, Robert Irwin, and H. C. Westermann. Through roughly chronological presentations as well as unexpected juxtapositions of objects, Carved, Cast, Crumpled explores the notion of sculpture in all its forms. This exhibition is organized by the entire curatorial staff of the Smart Museum of Art, with Senior Curator Richard A. Born as coordinating curator. This exhibition and its related programming have been made possible by the Smart Museum’s Pamela and R. Christopher Hoehn-Saric Exhibition Fund; Janis Kanter and Thomas McCormick and the Kanter Family Foundation; Barbara Fosco, the Fosco Family Foundation; Sharon Flanagan; and Nuveen Investments. Presented in the Elisabeth and William M. Landes Gallery, Janis Kanter and Thomas McCormick Gallery, Edward A. and Inge Maser Gallery, Robert and Joan Feitler Gallery, Joel and Carole Bernstein Gallery, and Richard and Mary L. Gray Gallery.